Comments Off on Were Our Soldiers In Afghanistan Betrayed By Politicians & Generals? Were Our Soldiers In Afghanistan Betrayed By Politicians & Generals? Poor leadership from the top brass? Military leaders failed to calculate the magnitude of the conflict in Afghanistan, the former head of the British army has told the BBC. Gen Sir Peter Wall said they thought they had a “reasonable force” for their limited objectives, but he now admits they got it wrong. 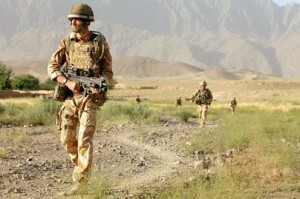 The commander in Helmand in 2006, Brig Ed Butler, said troops were “underprepared and under-resourced”. Peter Oborne in the Telegraph dots the i’s and crosses the t’s in a savage indictment of the UK’s political and military leadership. Reading Oborne’s article will make you angry – and frustrated. In essence good men and women were killed and maimed so that politicians and senior officers could grandstand at meetings in Westminster and Washington. The politicians (are you listening Mr Blair?) are now either waxing fat with lucrative speaking engagements around the world or are still in Parliament trying to sell themselves as the next government. I guess that also many of the senior officers slipped seamlessly into cosy and well paid consultancy positions in the UK armaments industry…perish the thought that better kit might be available off the shelf elsewhere. 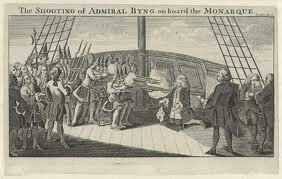 Metaphorically thoughts of Admiral Byng might well come to mind – and not just for senior officers…. Strange, isn’t it, that the BBC and its clones amongst the left leaning punditry consistently beat a negative drum over Britain’s involvement in the Falklands and the first Gulf War while our military presence in Iraq and Afghanistan has created a mini industry of reports. exposures and dramatic reconstructions that serve to underline the “futility” and social costs of these campaigns. But, with Syria you get the feeling that the mood music is quite different. Months of BBC reporting, highlighting the activities and sufferings of the anti Assad rebels has built up the pressure for that most seductive of all messages – “something must be done”…. Last week, the Prime Minister visited a UN-run compound on the border with Jordan and saw the conditions being endured by tens of thousands of fleeing Syrians. He said he was determined to do “more” and would be working with newly re-elected US president Barack Obama to up the pressure on Bashar Assad’s regime. Wonderful words, Mr Cameron – and it’s true that the Assad regime is brutal, bloodthirsty and autocratic and some of the rebels want to replace it with a liberal democracy. However many of the others have a different agenda – and we all know what happened in Egypt. However General Sir David Richards, Chief of Defence Staff has a dash of cold water for Cameron’s dream. Our political masters are quite happy to reduce the size of the Armed Forces, but their appetite to exercise influence on the world stage is, quite understandably, the same as it has always been. Exactly – we have been “intervening” for over a decade and at considerable cost for uncertain effect. It’s time to retrench and regroup and resist the temptation to grandstand on the world’s stage merely to satisfy David Cameron’s need to feel warm inside. Let’s give Syria a miss and concentrate on sorting out our own problems….. Comments Off on British Soldiers Abused, Attacked In London – Is It Those Presbyterians Again? British Soldiers Abused, Attacked In London – Is It Those Presbyterians Again? There wasn’t much about this outside the Telegraph, Sun and Express – I wonder why? Army officers have told troops on duty for the Paralympics to travel around in groups after servicemen were “attacked, verbally abused and harassed” during the Olympics. Those Presbyterians – always ready to be provoked….